When the first mobile phones arrived in Britain in 1985, you needed to fork out £3000, or £7500 in today's money, for the first mobile on the UK network. Some people earned enough extra money by being in constant touch to justify the cost of the phone and the exorbitant call charges that went with it. For the rest of us mobile phones were, just like car phones had been in the 70s, a plaything for the super rich. Mobile phones were not to be found in the upmarket shops of the West End of London though. Customers bought them from a few specialist start-up businesses, which advertised in the classified sections of the national broadsheets. The status factor was recognised as a prime selling point. A contemporary Martin Dawes' guide for salesmen talks about lightweight compact phones that could be carried in a pocket, briefcase or handbag and much beloved by the 'Yuppie element'. For collectors of mobile phones today the classic yuppie brick of the 80s is the ultimate goal and one of the most valued is the first ever hand portable, the Motorola 8000X. A couple of years ago there were stories of eBay values of over $2000 and the thought that they could be worth more now than back in the day; of course then you could use the phone as well. In the UK, with analogue networks switched off, they are nothing more than a desk ornament. In the five years from 1985 to 1990, Nokia and Ericsson joined Motorola as well as electronics giants NEC and Philips and a host of companies less well known in the UK in a race to dominate the mobile phone business. Mobile phones from the 80s still retain a certain amount of the mystic that they once had. This is our guide to phones that you could buy from the 1985 to 1989. In David Lodge's novel 'Nice Work' from 1988, Vic Wilcox, managing director of a Birmingham engineering firm, has a house with four toilets and drives a Jaguar XJS. Under the dashboard of the Jag is a carphone. A businessman in the provinces would not have been in the carphone owning class a few years earlier. The Post Office's pre cellular carphone System 4, the only mobile telephone service in Britain, was the preserve of the Bentley or Rolls Royce owning class. By 1988 the carphone had taken a small step down market. 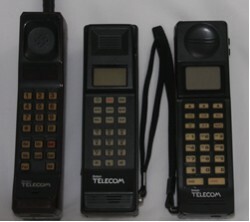 80s' businessmen had three types of mobile phone to choose from: carphone, transportable or hand portable. Carphones were, of course, fixed to the car, but boasted a better range than handheld mobiles. This was especially important since the two mobile networks, Vodafone and Cellnet, only served London initially. Transportables were carphones that could be removed from the car. They had their own batteries and could be carried for short distances. Building site foreman favoured this type of phone as it generally stayed in one place for most of the day. Hand portables were what we think of as a mobile phone today. They were the top end of the market. Hand portables were compact handsets, for the time, which could be carried in a brief case, or on open display, depending on how much of a show off you were. The hand portable phone ousted the Filofax as the ultimate status symbol of the 80s. Today hand portables are more collectable, although some of the early transportables are catching up value wise. There is currently little collector interest in carphones. There was also the 8000M for the US market. The 8000X was the world's first hand portable phone. The 8000S is very similar, but has one fewer button at the bottom of the phone. Prices, however, tell a different story. You will need to stump up £500 for an 8000X, whereas a good 8000S can be purchased for less than £100. The 8000S is probably rarer than the 8000X; at least fewer appear on eBay. Motorola announced a new phone in 1987, the 8500X. It had a new all over black look to the front panel and keypad and boasted a new function key to store names. It also had a larger LED display, otherwise it was identical to the earlier two phones. These are much more common than either the 8000X or 8000S, but nonetheless values are rising. The MicroTAC from 1989 instantly became the most desirable phone on the planet. It was a small, light, folding phone with a high price tag (£1765), whilst a Motorola 8500X was only £325. It was the first phone that was not a brick. All were sold as both transportables and carphones. The carphone version of the 4500X went on sale in 1985, transportable variants came later. 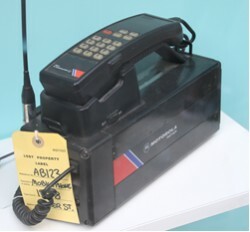 Nokia pioneered carphones and launched their first carphone, the Mobira Senator, in 1982 for the Nordic market. They made carphones/transportables for the UK, with the Mobira Talkman being the first. Nokia only made one hand portable in this era, the Nokia Cityman 1320. Unlike later Nokias, it did not benefit from Frank Nuovo's design genius. When he came to Nokia he did not particularly like this phone as all the keys were the same size and shape. Its uncompromising angular style does seem suited to the 80s though. You will also find the the Nokia Cityman 1320 branded as the Mobira Cityman 1320, they were identical apart from the brand name. Second only to Motorola, NEC made significant inroads in Britain's fledgling mobile phone industry in the 1980s. They made two principal products, the 9A hand portable and the 11A carphone and transportable. The NEC 9A was lighter and less bulky than other contemporary phones, but was expensive at £1795 in 1987; it was one of the most expensive handsets on the market. Nevertheless businessmen rushed to buy them and it was Britain's best selling phone for a short time. All were in BT's colour scheme of black and maroon. Also look out for the rare BT branded version of the Motorola 8000X. Mitsubishi was quick to launch a new phone in 1986, the Roamer, which retailed at £2000. BT sold this phone as the Pearl, but it was also available on Vodafone as the Roamer for the same price. The Mitsubishi Roamer was more of a slab than a brick. It has been overlooked by collectors to date, perhaps because the design is not so attractive. You see these in beige and grey colours, as well as the BT version. Philips were later known for their cheap and cheerful black entry level phones that were some of the first PAYG phones. In the 80s, Philips' only offering was much more upmarket. The Philips PRC30 from 1988 was known by some vendors as the Philips Prestige Portable. It came with a hefty price tag of over £1000 in 1988 at a time when vendors were slashing handset prices. However, it was actually a rebranded Japanese-made Kokusai which was also distributed with modified styling as the BT Coral. There is more than a hint of the military walkie-talkie about the design, especially in the brown colour. It was also made in grey. Panasonic made a number of transportables in the 80s, the E-Series and the C50. They also marketed a hand portable, the C10. A late entry in 1989 was the OKI 700E distributed through Martin Dawes Communications. It was either the last of the 80s bricks, or the first of the new age. "Trying to get info on my 1st car phone. NEC EZ-2401-A NEC America Inc.
"I gave old Mitsubishi 3000Spk cell in the original box which I bought many years ago I would like to sell it. what is the value for it? "Hi I have motorola vodafone but not Shaw on model? "Hi, please l have a mobile telephone transporter E-TACS ORBITEL 300 which l would appreciate if you can tell me the present sale value of. Does it have any value.